Wire Animals - unique sculptures made from wire. Announcement Unique wire sculptures made by the artist Nakisha. One of a kind bird sculptures and animal sculptures with free shipping in the USA. Occasionally, work by my students may be listed in the shop as well. 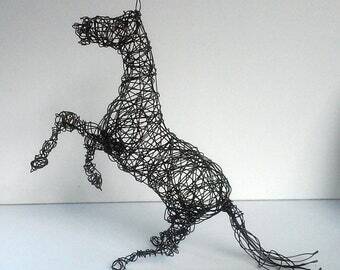 Unique wire sculptures made by the artist Nakisha. One of a kind bird sculptures and animal sculptures with free shipping in the USA. Finished birds waiting on the window sill. Here on Etsy I am better known as BlueDogRose, the "bunny painter" (though I do paint other things!). I love sculpting as much as I love painting. I have been using wire to sculpt since childhood, but really began to explore it more in college. I have a BFA degree in sculpture, and my senior show included several large wire pieces. I made my first bird in the early 1990's. I love the idea of starting with a line then using that line to draw in three dimensions until there is a free standing sculpture. The finished sculptures have a strength and presence, while drawing you in from every angle (pun intended). I have made all sorts of creatures; horses, dogs, elephants, deer...the list goes on, but birds remain my favorite. 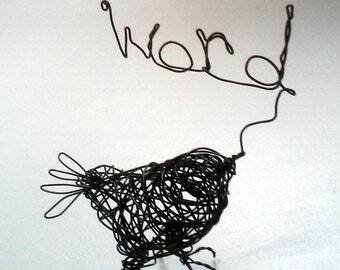 I also like to make kinetic pieces, mobiles and sculpture that says something (like the WORD birds). An artist who has been making art since her earliest memory. She has been on Etsy since 2006 and has a lot of feedback under bluedogrose.etsy.com. 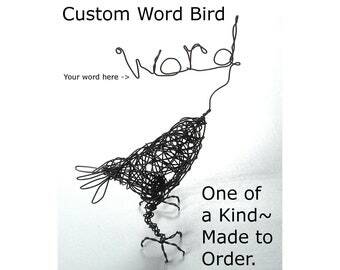 If there is ever a problem with an item you purchase from Wire Animals, please contact us as soon as possible, I will happily work to resolve any issues that arise. Your item can be returned in good condition within 2 weeks of receiving the item for exchange or refund. The buyer is responsible for return shipping costs. Shipping charges will NOT be refunded. Please contact us before returning any items. Payments received via "Echeck" through Paypal will not be shipped until payment clears, usually 3-8 business days after the transaction. I always ship promptly and make every effort to get your items to you as soon as possible, however, I cannot guarantee the arrival date of any item. All items ship via the US Post Office, you can check your order at any time on Etsy to see tracking information. Most USA shipments will arrive in 3-5 days International shipping averages 1-3 weeks. Is the item a gift? I will be happy to include a personalized message and gift card at no extra charge, just let me know in the comments to seller section at check out. International shipments- items being held in customs may cause extended delays up to a month or more. Unfortunately I have no control over this, and am not responsible for these delays, however I always ship promptly with the correct customs paperwork. I am not responsible for custom fees or import charges. Sorry, I cannot lie on customs forms. Please check with your local Post Office if you package hasn't arrived after 3 weeks, often they are held for pick up. Please make sure your address is correct, I am not responsible for items shipped to incorrect addresses (as entered by you into Paypal or Etsy) or for items that are not delivered because of refusal or inability to accept the delivery or claim such packages at the Post Office, or refusal to pay customs fees or taxes. With packages that are returned to me and for orders that are canceled because of this, the shipping cost will not be refunded. No additional shipping charges are added for additional purchases from this shop. You will be charged the shipping cost that is the higher amount, but the rest of the items purchased at the same time ship for free. ...USA- Purchase before December 14th. I use recycled and recyclable shipping materials, and reuse clean packaging when available. If an item is damaged in shipment, please contact me immediately. Your item is packaged to arrive in perfect condition. If the item is a gift I am happy to include a gift card with your message at no cost, just let me know in the comments at check out. Most sculpture is intended for indoor use only, unless stated in the description. 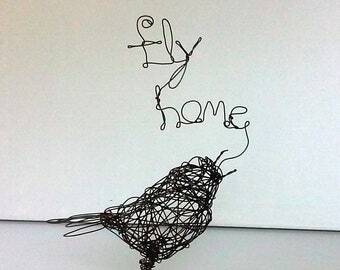 Wire sculptures may rust if exposed to the elements or left in a humid environment. A clear spray varnish may be applied for protection outside, however the artist assumes no responsibility for rust due to exposure. Annealed wire is not food safe, and these sculptures are not intended to be displayed with food. The artist retains all reproduction rights and copyrights to the artwork in this shop even after sale. The sculpture and photographs may not be reproduced without the artist's express written consent.